After Belgrade 2007, Germany reached the eight consecutive final. For the title in the Men’s Teams Event at the TMS European Championships they will play against host nation – Portugal. Portugal reached the final after thrilling encounter against Sweden. It was a match full of turnovers that fired up fantastic home crowed in MEO Arena. 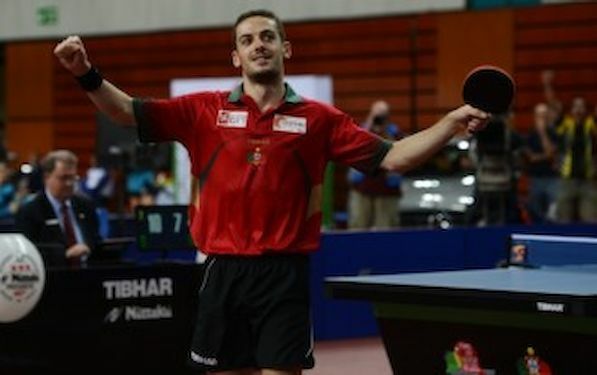 Joao MONTEIRO gave Portugal good start after victory over Kristian KARLSSON. He needed four games, one more then Marcos FREITAS in next match. FREITAS succeeded against Par GERELL in straight games. With 2:0 in the pocket and impressive game Portugal was already with one leg in final, but… Tiago APOLONIA had advantage 2:1 against Jon PERSSON before he lost two final sets by narrow margin. Five match balls were wasted in decisive game. The situation had not looked that bright when Marcos returned to the table. He was two games in reverse against KARLSSON before he leveled to win the match. “We started very well. I was very confident against GERELL and MONTEIRO showed great performance against KARLSSON, but Sweden is very good team, they were all the time seeking for their chance. They seized the opportunity against APOLONIA and KARLSOSS had outstanding start against me. I can not tell I was playing bad, he was just very good,” explained Marcos who play alongside KARLSSON in the French club Pontoise Cergy. Germany beat Croatia on their way to the ultimate stage. Steffen MENGEL lost his opening duel against Andrej GACINA, but Timo BOLL and Dimitrij OVTCHAROV stayed on the winning tracks. BOLL beat TAN Riuwu, whilst OVTCHAROV succeeded against Tomislav KOLAREK. In the final game, Timo overcame GACINA who suffered his first defeat at the Championships. “GACINA played fantastically this tournament. He is really in top shape here,” stated OVTCHAROV after the match.